The Jerseys, a Channel Island breed, were very well represented at the St. Louis Worlds Fair. Many of the entries were imported by millionaires three years prior to the Worlds Fair in hopes of winning the competition. The exhibitors were congratulated on their efforts of traveling far distances to show their prized cattle. 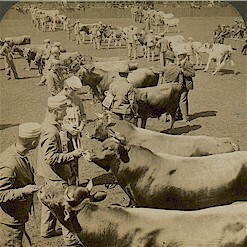 Many top bulls were brought to the Worlds Fair. Big names at the Worlds Fair Cattle Show included millionaires such George Vanderbilt, Thomas W. Lawson, the “Copper King” and representatives of the Ladd estate of Portland, OR. The Jerseys at the World’s Fair were truly valued as they were covered with costly blankets for protection from flies, dirt, and dust. The halters and trappings for the animals owned by the millionaires were made of leather and were often silver mounted. Jersey breeders were able to view the exceptional show of cows in the test barn as well as the cattle in the show arena. In the show ring, bulls were lined up for judging. The best aged Jersey bull at the Worlds Fair cattle show was Merry Maiden’s Third Son, owned by H. O. Taylor of Oxfordville, WI. 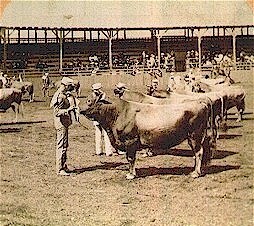 The bull, a direct descendant from Brown Bessie, the winner of the dairy tests at the Columbian Exposition, was valued at $10,000. Taking second and winning $100 in the aged Jersey herd was the imported Brookhill Fox, owned by Doctor C. E. Still of Kirksville, MO. Figgis, owned by millionaire Lawson, won the blue ribbon in the aged cow competition. 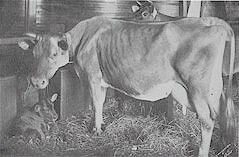 She was competing against cows from Vanderbilt, the Ladd estate and other known herds. The Jerseys were mainly judged by W. R. Spann, Dallas, TX. Due to Mr. Spann’s interest and having bred one of the entries, W. Gettys, Athens, TX, and M. W. Terrell, San Antonio, TX were brought in to judge. Photos from The Breeder's Gazette and Irwin Collection. This page was designed by Amanda J. Smith and is maintained by Lyndon Irwin.